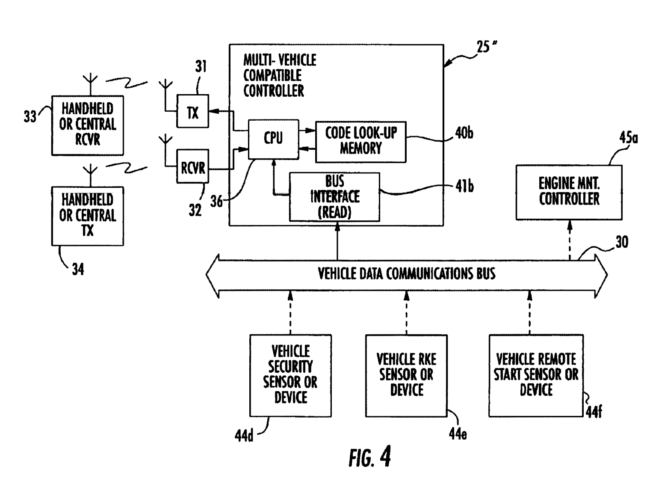 Omega’s patents cover remote control and monitoring systems for vehicles. The defendant, CalAmp, helps companies and governments monitor their vehicles (location and status, such as battery health and vehicle speed). In the infringement trial, a Florida jury sided with the patentee – finding the patents willfully infringed and not invalid. The district court then trebled the damages and awarded attorney fees — for a tidy sum of $15 million (with an ongoing royalty of $13 per unit). On appeal, the Federal Circuit has made several interesting rulings. In a later post, I’ll return to the validity issue. This post will focus on infringement: Some of Omega’s claims require both “a transmitter and a receiver for receiving signals from said transmitter.” (33 and 31 in the figure above). CalAmp’s accused device has the transmitter, but the accompanied receiver is a cell-phone tower. Since CalAmp does not supply cell towers, the appellate panel found CalAmp cannot be a direct infringer under the All Elements Rule. Making and Selling vs Using: Note here that we’re talking about system claims, and the patentee particularly accused CalAmp of “making and selling” the invention. As explained below, infringement allegations for “using” an invention can be treated more expansively under the beneficial control doctrine. “[T]o use a system for purposes of infringement, a party must put the invention into service, i.e., control the system as a whole and obtain benefit from it.” Centillion Data Sys., LLC v. Qwest Commc’ns Int’l, 631 F.3d 1279 (Fed. Cir. 2011). “[A] person must control (even if indirectly) and benefit from each claimed component.” Intellectual Ventures I v. Motorola Mobility, 870 F.3d 1320 (Fed. Cir. 2017). Here, there was evidence from which the jury could infer that customers controlled and used the system and received the required benefits. In other words, the cell-phone tower was being “used” by the customers as part of the system, and therefore it didn’t matter that they were owned by and more generally controlled by a separate entity. Despite finding potential liability here, the court substantially vacated the infringement verdict on other grounds (informing the jury of the proper claim construction / proof of knowledge for inducement / etc). At the end of the appeal, only one claim was left as valid/infringed. The Federal Circuit determined that the patentee had not provided sufficient evidence at trial to support the full damage award based upon that lone claim. Thus, the new trial will also be needed on damages. Ben, the hobbling of a legal and moral right to the fruits of one’s (actual) inventions is indeed another intolerable cost. If the problem were limited to “do it on a computer” issues, that would be bad enough, but it’s not- it’s a problem with inventions in a number of domains where pure information is the source of utility. “Do it on a computer” is really a 103 problem. Patenting certain kinds of logic and information is a 101 problem. Unsolved. Yet again, Marty, you want to operate in a domain for which you clench tight your eyes. It has NEVER BEEN about some total legal and moral right to the fruits of one’s (actual) inventions. It has ALWAYS BEEN about the difference between an inchoate right and a perfected property right (and the fact that a perfected property right has BOTH carrot and stick attributes). The stick portion comes from the fact (true since the founding of this country) that one person’s invention WILL TRUMP the ability of another who may (at a later time) independently come up with the same invention. While not in your current post, I do recall that you have had problems understanding this type of “preemption” that has always been part and parcel of the US Patent system. Good grief, can we get some better tr0lls please? Focus less on snark and more on actually making a substantive contribution and you won’t see that problem. How will they pay for another $3-5M trial? There are not enough damages. We have to have litigation reform in this nation. There is a lot of commerce that is unprotected. Probably 99.9% of startups cannot obtain relief in the current system. These frequent remands are devastating. No question that D.C. patent litigation [especially with a judge unfamiliar with patent law?] plus an appeal, plus a remand and another trial, as here, is incredibly inefficient and costly. This suit was filed on December 20, 2013. One of these days, after a more recently filed suit, I predict that some party is going to sue their attorneys for at least part of their huge litigation costs that would have been avoided by an IPR after some other party does so successfully against the same patent. You may well have a point here, oh Cheerleader of the IPR. It indeed would be a prudent move for ALL litigation counsel to include a discussion of options for both sides of a legal battle involving patent enforcement. Perfect response. Patent affirmed as not invalid. Your response is they should have killed the patent. Message to inventors is don’t bother. I fear yours is the prevailing view. The validity of these patent claims as either valid or not was apparently never tested or tried, as is normal in most patent litigation, not just in IPRs, The claim construction, willfulness and attorney fee issues were apparently miss-tried. Both parties also spent a great deal of money on infringement issues. Yet the patent owner has still not collected anything yet anyway! One good thing here is that the patent apparently had multiple claims of varying scope and format, so that one claim is still in play. That is supposed to happen prior to grant — as some of us (hint: me) have been consistently championing WELL BEFORE the AIA was enacted; with wanting the focus to be on improvements to examination quality as opposed to the general efforts to weaken patent rights with “after the horse has left the barn and NO structured feedback loop into examination quality” that we have with IPRs and the like. Before PROST, Chief Judge, DYK and WALLACH, Circuit Judges. Anon, as for Monday morning quarterbacking, I also wondered if the defendants here had put their defense fully into non-infringement which they were convinced of, and not presenting a prior art invalidity case? These were old patents, but remote monitoring of trucks and airplanes is also old. That prior art might well not have convinced a jury, but at least they could have preserved that argument for appeal, and maybe at least avoiding willful infringement enhanced damages and attorney fees from the D.C.? agreed – the one side in this matter appears to have been severely under-served. That look-up memory is truly magnificent. One of the most sublimely engineered look-up memories I’ve ever seen. My g o d these incredible geniuses figured out how to automatically transmit information about the speed at which a car was traveling through space! And they did it using only off the shelf components functioning exactly as they were intended to function PLUS (and this is truly remarkable) they used codes for identifying the vehicles. And the vehicles were even made up of protons, neutrons and electrons (all configured according to age old and conventional laws of nature). A flash of genius is not required. Nobody said “genius” was required. Of course, some sign of intelligence beyond “hey automatically transmit this info using components for their known functions” is far far far from that. “Sub-clever” is a good term. And in the Act of 1952, Congress explicitly chastised them. The Court did AGAIN (in different words) recently – that notion of “inventive step” and “significantly more” (and other terms in their decisions that they did not bother to define – even expressly stating that they were NOT defining the terms — as in, they could have, but did not use a common dictionary). Of course, these points have long been presented to you Malcolm, and yet, you EVER evade them. Yes, we all know why. You think the patentees here “tinkered around” with these components and “discovered” for the first time that they would work? Maybe you and Bildo should step outside and get some fresh air. I hear Bildo’s really good at blowing it around. Might be too hot for you, but maybe it’s just what you need. If not implied, are you stating that your snark was overt in wanting “genius” involved here? Or did you want to ignore the quote that Les provided to you? No. I’m stating that anybody who thinks that my snark implied that “genius” was required to get a patent is a f king br@ in-damaged id I 0t who needs to stop smoking patent crack yesterday. Malcolm is playing games with you, jumping between a purely mindless ad hominem (with his follow-up “NO connection, as per his post at 4) and his attempted snipe at the present case (with his snark tide to an aspect of the “purported” invention). He either IS doing as you stated initially, or he is backtracking and changing his story (and moving from the frying pan directly to the fire, as he moves from a mistaken snark to a completely mindless snark. Either way, Malcolm is being Malcolm. That is to say, prior to 1952, the patent law as written had provided to the judicial branch a leeway to use Common Law law writing to “evolve” the meaning of invention (the prior-to-1952 version of eligibility). The Court has basically squandered this with dozens of variants of “gist of the invention,” inventive gist,” inventive step,” and the like – never getting to the point of actually coalescing the meaning. Any attorney worth their salt (and any non-attorney who desires to speak intelligently on the subject) KNOWS THIS, as the seminal writings of those who helped write the Act of 1952 have long spoken on this topic. So why do we STILL have this charade, this merry-go-round of obfuscation and dissembling? Why do we have the likes of Malcolm continuously confusing can conflating 103 into their 101 positions? The simple reason is that there are some with a different viewpoint, a different philosophy, different feelings about what should even be patent eligible to begin with. Those people simply do not want what the direct words of Congress portends when it comes to the facet of eligibility. Which (again) circles around to a recent post by me – notably a post that has NOT been engaged by any of the typical anti-patentists here (except with attempts to denigrate and dissemble on the issue by Malcolm, and a rather weak input by MaxDrei). You and your cohorts are entitled dissembling @ h0les, Bildo. It’s experienced honest patent attorneys like me (who can write coherent sentences and make reasoned arguments) who keep sh-itheels like you in line. …and that “Legend In Your Own Mind” thing comes through loud and clear, Malcolm. Maybe – just maybe – if you did more than merely expound on your feelings, you might have a point here. As it is, you do not have a point here. Here is some 50+ year old technology that would be dead-to rights prior-art in any sane universe. The face that our system can’t deal with this kind of horror show – for the defendants, and for the public, is a tragedy, at least for the firms destroyed by these weapons of economic destruction. As I recall, Apollo telemetry was transmitted on a regular basis and transmission was not triggered when the command module violated a speed limit as determined from speed data received from a vehicle bus. Les is that a joke? All of the data sent by the CSM came off either of two AC or DC busses. Every time a burn was done, the speed was determined onboard, and transmitted- you can bet your azz if a speed limit was violated, the vehicle would be interrogated. Are you really going to pretend there was one bit of invention in this patent? Sad. Really? You’re going to read “bus” as power bus? The claims are clearly referring to an automobile data bus. I think you’ve got a Main Bus B under volt. “The Apollo S-band system provided for accurate range (distance) measurements. The ground station generated a pseudorandom noise (PN) sequence at 994 kilobit/s and added it to the baseband signal going to the PM transmitter. The transponder echoed the sequence. By correlating the received and transmitted versions the elapsed time and so the distance to the spacecraft could be determined within 15 meters. Les the ground tracking was a backup to the Primary Navigation & Guidance system, which constantly maintained an inertial velocity and position (state vector) computation. You gotta be kidding me. The state vector was compared to a ground calculation constantly. If you want to credit these inventors with a signal bus, that’s fine….but the Apollo G&N system used dedicated and power buses for various telemetry functions. This ‘invention’ is a joke Les. Defend it all you want. I’m not defending the invention so much as noting the flaws in your citations and eye-rolly evaluation. The fact of the matter is there are differences between the prior art you cited and the claimed subject matter. That link you provided discussed a box or two that did analog to digital conversion and provided digital data to the computer(s) and did digital to analog conversion to provide analog control signals to actuators. Even if one could call the method of digital communication between the computer(s) and the box(es) a bus, it could hardly be called a vehicle bus and is nothing like the CAN bus now used in many automobiles so that the radio knows the convertible top is down and the convertible top actuator knows the ambient temperature and how fast the car is moving. While I did not review that entire page, I did not see any indication that devices of Apollo modules communicated with each other over the power lines. Your (anti-patent) feelings are showing through…. Don’t forget that it’s a tragedy for actual inventors too. One of the plausible “end games” for the 1952 law involves inventors realizing that their interests may not be aligned with people whose mortgagee are paid for by churning out “processor configured to (result)” claims. Your mindless and off-kilter swipe at attorneys as if they operate without a binding code of ethics is noted, Mr. “Malcolm Upvote” Ben. Maybe, just maybe, if you had any c1ue as to what you were talking about (instead of wanting to project — en masse — some unsavory mercenary attribute), you might not be so “tarred” with the Malcolm brush….